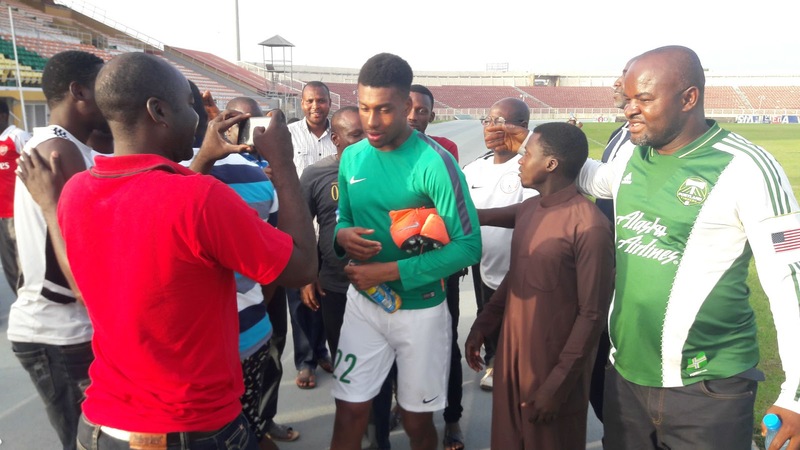 Super Eagles strikers Kelechi Iheanacho and Alex Iwobi were mobbed by fans after their training session on Thursday, October 5, as team captain John Mikel Obi escaped with others. After training for two hours under the intense heat on the practice pitch of the Abuja National Stadium, fans broke the through the securities and ran into the field to take pictures with their favourite stars. Mikel was the first to escape into the bus as Karl Ikeme and Ogenyi Onazi followed. However, it was too late for the Manchester City and Arsenal players to also find their way into the bus as they were surrounded by fans who struggled to touch and snap with them. Mikel faced a similar situation in the friendly match against Plateau United before it took the intervention of five police men to break him loose from the mob. Super Eagles will fly to Zambia on Saturday, October 8, and will have one more evening training session in Ndoli before the cracker against the Chipolopolo on Sunday, October 9. Both teams will field their full strength squad as Chelsea’s Victor Moses and Watford’s Isaac Success have been ruled out owing to injury problems. Odion Ighalo has been excused to attend his father’s burial as Olympiakos Brown Ideye is favoured to start in attack.